FHPA, who represents Finland in CETOP, aims to maintain and support a successful and developing high-technology field which acts as an innovative trendsetter in Finnish industry and is a respected employer. This important association celebrates its 40th anniversary this year. The Finnish Hydraulics & Pneumatics Association (FHPA) was founded on 1 February, 1977 to represent and serve companies from hydraulics and pneumatics fields operating in Finland. The initiative came from several experienced key persons in Finnish companies, who saw the obvious need for developing operating prerequisites and improving general awareness of hydraulics and pneumatics fields in the Finnish market. Concrete development needs were found related to trend following, trading fairs and other exhibitions and developing training in this field. The association's board met for the first time on 10 March, 1977. Conducting market research was regarded as important and preparations started immediately. The first special exhibition was held on the premises of the former Helsinki University of Technology, nowadays Aalto university, in Espoo on 22 - 24 March, 1979. FHPA still aims to maintain and support a successful and developing high-technology field which acts as an innovative trendsetter in Finnish industry and is a respected employer. In accordance with its mission, the association promotes development of hydraulics and pneumatics fields in Finland and takes care that these fields have conditions for success in the international market. FHPA takes action on topics that benefit the association's member companies focusing on helping the field with general awareness and image control, preparing timely information about the market with continuous market and trend research, maintaining general awareness at trading fairs and other events, developing training in this field and keeping good connections with the educational facilities in Finland. The Finnish Hydraulics & Pneumatics Association currently has 62 member companies. They are mainly subsidiaries of international companies engaged in exporting or domestic import companies. It is, however, good to notice that our member companies also include important totally domestic manufacturing companies also engaged in exporting. Member companies combined sales in 2016 were 535 million euros, which covers about 80 % of the fields annual combined worth in Finland. In recent years there has been a bear market and also a decrease of about 3% since 2015 so the market has not offered us support at all. However, this year shows clear signs of recovery. On the basis of trend studies, sales in the first quarter increase by 7% compared with the first quarter of 2016, which is welcome news for us who are celebrating our 40th anniversary. 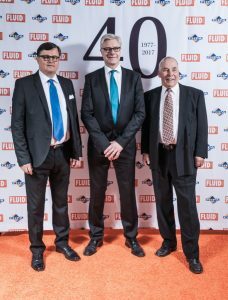 The Finnish Hydraulics & Pneumatics Association celebrated its 40th anniversary at its Annual Spring meeting followed by a gala dinner at the Marina Congress Center in May. Celebrations continued at the Technology17 fair at Messukeskus Helsinki Exhibition & Convention Centre in October. The association participated with a own stand, where hydraulic piping training audited by FHPA was presented, in collaboration with the organising educational institutes. Chairmen of the board (from left to right): Kalle Tuohimaa, Ilari Orpana and Paul Pallasto.